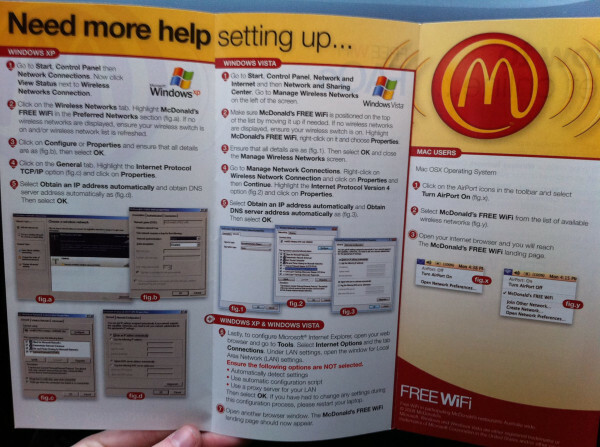 These are McDonald’s instructions for how to connect to WiFi. If you have XP, a full page plus another third of a page. Vista is a little better, taking essentially a page. Maybe there is some progress in Redmond, after all. On the other hand, the Mac is there all by itself taking 1/3 of a page and looking happy for it underneath the beaming McDonald’s logo. I’ve personally had the experience more than once of trying to get a Windows Laptop to connect, failing, and then whipping out my iPad and having it immediately connect without a problem. I’ve wished on several occasions the iPad could just tell me what it did so I could do that on the PC. Hey, maybe there’s an app for that! The amazing thing is Microsoft spends billions on R&D, billions trying to create a viable web business, and has access to more smart developers than anyone except possibly Google or IBM. It isn’t that they can’t do it, it’s that they’re not even trying. They have no earthly idea what they should be doing to delight customers. Kinnect? Well, even a blind squirrel gets a nut every now and then. Apple doesn’t get everything right either, but jeez Louise, when it’s right under your nose you have to make the effort. You gotta play to win.